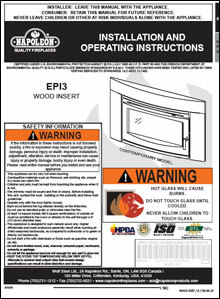 The Napoleon EPI3T and EPI3C are the newest editions to the Napoleon wood burning insert line. The Napoleon EPI3T has a traditional flush front with a cast iron surround and the EPI3C has a contemporary flush front with a cast iron surround. Don’t live with an old drafty fireplace any longer! One of these great wood burning inserts will give you the heat you have been craving.